Serb Djokovic, 31, won the Sportsman of the Year award after claiming victory at both the US Open and Wimbledon. Golfer Tiger Woods won the Comeback award, while tennis player Naomi Osaka won Breakthrough of the Year. America's 14-time major winner Woods won the season-ending Tour Championship by two shots to record his first win in five years following spinal fusion surgery. Japan's Osaka won her first Grand Slam title at the US Open last year, then won the Australian Open last month. Elsewhere, Slovakian skier Henrieta Farkasova and guide Natalia Subrtova won the Sportsperson of the Year with a Disability award after winning four gold medals at the 2018 Winter Paralympics. Football World Cup winners France won Team of the Year, and Kenyan athlete Eliud Kipchoge took the Exceptional Achievement Award after taking 78 seconds off the world marathon record with his victory in Berlin. 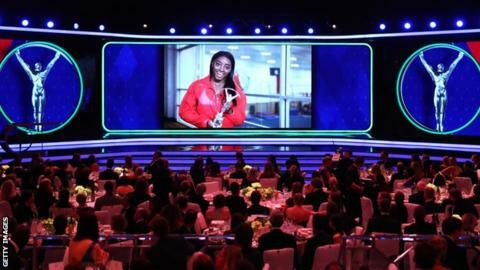 American snowboarder Chloe Kim was given the Action Sportsperson of the Year Award, former Arsenal manager Arsene Wenger received the Lifetime Achievement Award, and American skier Lindsey Vonn won the Spirit of Sport Award.